From daring cardmakers: I dare you to make an Oriental themed card which doesn’t use Red or Black. 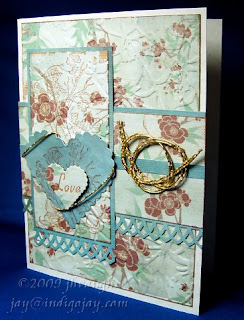 From the Cuttlebug Challenge blog: ....this week's Cuttlebug Be inspired #17 is "LOVE". And finally, I chose to use a card layout from Mojo Monday. I used patterned card stock from the DCWV Far East collection. Wouldn't you know it--the flowers look almost reddish there, but they're more brownish-orange in real life. The borders were punched with the Martha Stewart Lattice Arch punch. The stamped images are by InkaStamps and stamped using Memento Potters Clay dye ink. The hearts are Spellbinders Nestabilities die cuts. The subtle texture of two of the panels was made using the Floral Screen A2 Cuttlebug embossing folder. Finally I added some Mizuhiki cord embellishment. Seems that I've been making much simpler cards lately. It was fun to make one that used more layers and more elements. Now I have that same DCWV stack and the embossing you’ve done makes the paper look so different. It’s a very clever touch! Thanks for joining in my DCM’s dare this week. Jay, this is beautiful! I love how you have embossed the patterned paper, it looks great! And that punched border looks gorgeous too! Thanks for taking part this week at http://cuttlebugchallenge.blogspot.com/. This is fabulous, just love that border. Fabulous blog. What a lovely card! Your choice of colors is fabulous and I love all the different layers of the card! Great job. Thanks for joining us this week at CB Challenge. LOVE your palette & that border punch is so beautiful! thank you for the incredible inspiration @ www.cuttlebugchallenge.blogspot.com this week! Beautiful card! Thanks for playing with us this week at CB Challenges. Thanks for visiting my blog and for taking the time to leave a comment. :-) Don't be surprised if your comment doesn't show up right away. Because of the amount of spam being posted these days, I've switched things over to moderated. Legitimate comments will be appreciated, approved, and published in a timely fashion.